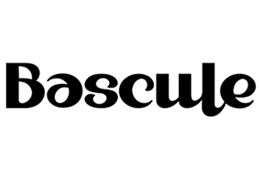 Video and music. 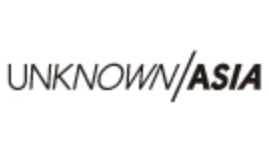 Something new will come out again from here. 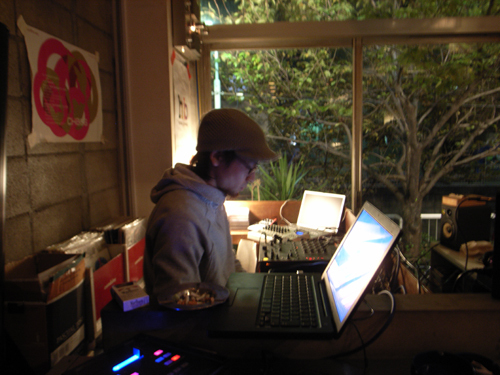 From 1st to 30th of November 2007, “DOTMOV FESTIVAL” was held in 4 cities in Japan. 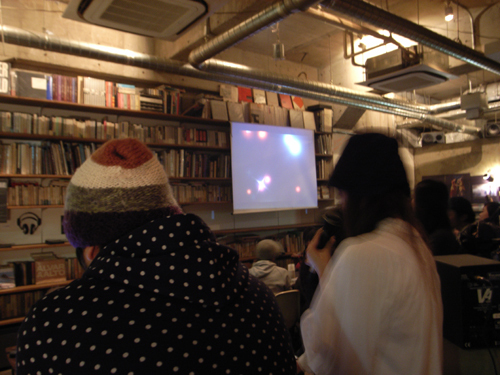 In Tokyo, a book cafe space in Nakameguro “Combine” had presented screening during the festival month. 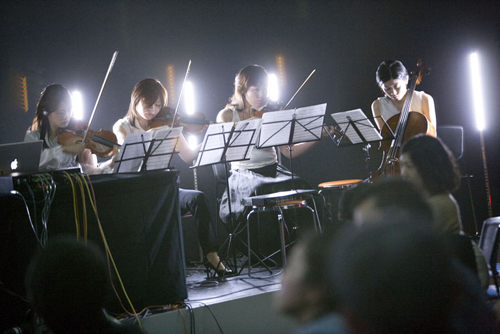 Also as a collaborated event, there was “Media Opera <h />our<br />link” directed by Hideaki Takahashi aka Mjuc at Asahi Art Square Hall, as well as a DOTMOV special event at Combine cafe. 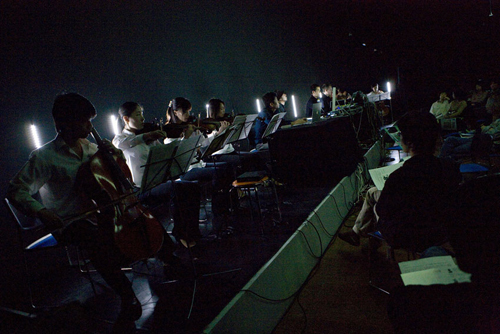 The “Media Opera <h />our<br />link” on 17th and 18th of November at Asahi Art Square, was a marvelous space suddenly appeared in an old town in Tokyo. 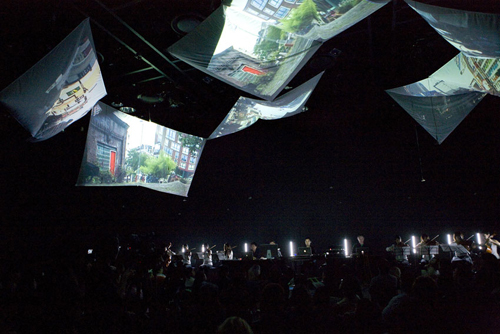 Different from a general opera style, the venue had no main stage, but only a booth for sound and visual players, 6 multi-projection screens suspended at various angles from the ceiling, LED light displays, speakers, and that’s it. 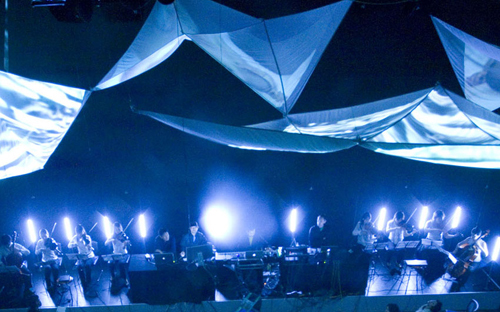 For about an hour and a half, the performance with sounds and visuals brought the audience to its marvelous world. The introduction part made us feel our deep consciousness with pitch-darkness, fragment of abstract sounds and blinking LED. The second half showed those fragment sounds turning into clearer musical composition with visuals on the multi-projection screens. I interviewed a director of this event, Hideaki Takahashi, who hotly challenged the new form Media Opera. Please tell us the concept of “Media Opera <h />our<br />link”. The theme was something like “imagination to others” and “awakening of reality”. There are things happening in the actual world but we are not too aware of. The concept was to condense those things into short hours. How did you choose the form of “Media Opera”? I’ve been doing many live performances using visuals, which were mainly with abstract expression, but I noticed on this event that I had something to express more with themes, and had a feeling that we need some comprehensive way of expression. That was the beginning, so it’s not that I “chosen” the form of Media Opera. I didn’t even know how I could call something like that. To tell the truth, I felt a bit uncomfortable to call it “Opera” because it strongly reminds the traditional Opera, but it could be ok as something like composite art with a theme. Speaking of Opera, a story usually consists of elements such as lines and songs. What was the reason you made effort to avoid those elements? The primary reason we didn’t use lines at all was that I wanted to let the audience free without holding their imagination by words. Again, “Media Opera <h />our<br />link” had a theme of course, but it’s not that we put a story in it, but I was thinking a role as a trigger to get certain things out of the audience. I had a impression that the whole work was very abstractive, and that each individual could receive various meanings from it. What was the idea to this direction? That was the most important part of this work, I think. Hopefully, individual memories or thoughts people are not really conscious of in daily lives would come out while watching this work. As another impression, the video was especially fragmentary, and children from various ethnic groups and international news video on the screens were symbolic. What did you mean by that? I meant something to be able to see by juxtaposing fragmental things. I think there are still shared parts or things we can relate to in this society or current world which have different situation, thoughts and lives. Especially these are a lot in childhood, and that’s why we showed various children playing in all innocence. On the other hand, the international news video has big problems with the way to carry, and in the receivers, in my opinion. So we tried to provide the situation of looking down upon those news. Actually, the scene uses enormous amount of news source in visuals, but the sounds were selected and used only some parts. The real society has also those filters including intentional one by media and unconscious one by individuals, and the idea was to create such situation in the intentional form. The video also showed communication or information problems we currently have. Could you explain it with some concrete descriptions? In the point of information, there were scenes of real war and fake (game) one in equal rank, which both probably seemed real video at a glance. It was an intentional setting, but we meant a dangerousness in the real world. We can take things happening in the current world as information, but those information can be different depending on how to provide it. We cannot see the real without doubting it all the time. As an artist, how do you approach these problems in music or art? I think music is originally abstracted even if the musician brings very concrete problems into it. The abstract is the characteristic and the goodness of music. So basically, I’ve never expressed social problems in music like we did this time. Just I recently got desire for looking into those problems once, and the result was this work. 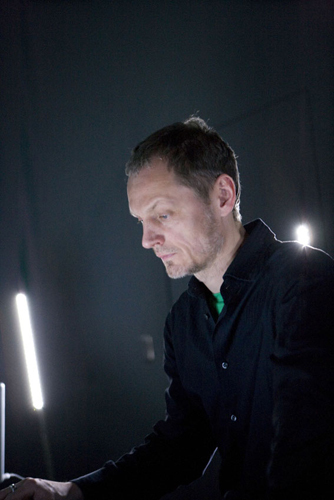 Including music, various elements such as sound technology, visual image and device technology constitute this work. Are there any episodes by the collaboration linking those fields and making into one work? As coordinating the whole, it was not that we fixed the idea from the beginning, but for example, we had 16 super tweeters hanging from the ceiling this time, and the idea was from PA’s Mr. Abe unwittingly saying “PA company of my friend has 50 super tweeters”, and we just said let’s use it. (Actually, 50 was impossible in relations with weight and branching.) And then, it might be interesting if the sound of news source come out separately from each 16 super tweeter…like that. There were also many ideas from the stage environment. However, it was intricately linked each other, and we didn’t even know how to start. Almost all the time of the first several months, we couldn’t actually work with concrete ideas, but only had meetings. The 8-piece strings ensemble and the free vocalization by Yutaka Fukuoka was impressive. What did these two live performances mean? We had strong meaning to those two live performances, or rather to sounds mainly with noise coming from laptops which took over the first half. Mr. Fukuoka’s voice had especially a strong presence, and we commended him something Shaman-like meaning or primitive pray. As for the strings also, the composition was being conscious of expansivity and an organic presence to the noise of the first half. Various programs including LED lights were used on the sound and visual direction. What technologies specifically did you use? LED was controlled by application for DMX signal control, which was able to connect with external signal, but we programmed control pattern of LED and used midi trigger for the timing. As for the visuals, we got it through in real time with Max/MSP. (It actually turned out almost a manual control by Mr.Matsuo as there were troubles in synchronization at the actual performance.) 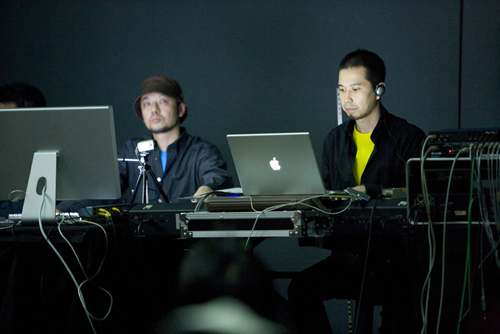 The influence of sounds was almost by the placement of actual speakers, but Uwe was working on real time effect for Yutaka Fukuoka’s voice and the strings. How did you get a response? 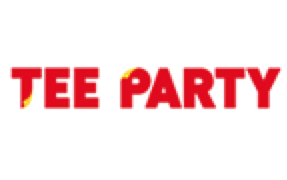 The response for this event was most unclear experience ever, well, that is, there were both pros and cons for various parts, but I felt I made resistance. It might be a work being completely different depending on the situation or point of view of the audience. The constitution was never easy to understand, so it could be incomprehensible if seeing the surface layer. There were also lots of things to think as a director. I think I need to build up my experience more and more. Are you going to continue this event? I don’t know if we are doing it as Media Opera, but I think the interest fact of making things with many people is where it sprays from the initial or personal blueprint, which is different from making by oneself. At the same time, it’s appealing that there’s a lot of possibilities which cannot be drawn by oneself. In that sense, I’d definitely like to continue the project like this. Let’s keep a watchful eye over Hideaki Takahashi (mjuc) who makes a new challenge as a musician. DOTMOV TOKYO special event was also held at Combine with live shows by 3 artist groups; Takafumi Tsuchiya who has been invited and highly evaluated in video-related international festivals, and also is a creator of “WITH RAIN” which was one of the selected works of DOTMOV FESTIVAL, audio visual performance by Moskitoo who recently released an album from 12K, Takafumi Himuro who established a label tngrm and released an album, and a German electronic musician Uwe Haas who took part in the “Media Opera <h />our<br />link” by Hideaki Takahashi mentioned above, with sound processing. Starting from the PolyRhythmic show with electronic sounds by Uwe Haas, which could be called minimal dub, the event provided screening of selected works of DOTMOV FESTIVAL, break beats by Takafumi Himuro from tngrm, Takafumi Tsuchiya’s abstract but colorful and organic visuals, audio visual live by Moskitoo which constructed kind of eccentric world-view with superb balance between electronics, fantasy and craze. Even though it was a weeknight show, many visitors filled the space. 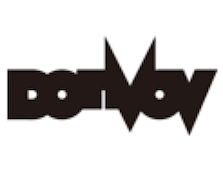 It freshly showed people’s high interest in video and music, and one of the possibilities of DOTMOV to be an opportunity to create something new from here, with such an event not only as a place to make presentations but also taking a role of nodal point between people. 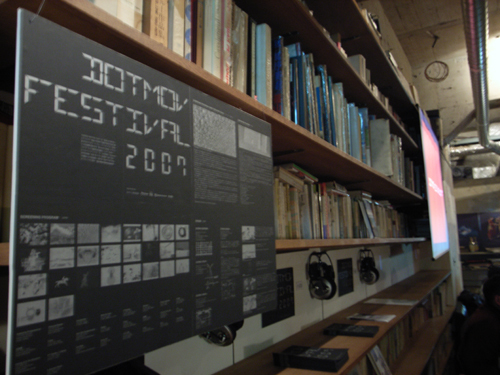 DOTMOV is a movement continuing still after the festival period. It was one of the few widely open festivals in the world selecting movies only from public subscriptions and screening it in several areas.